The event is the fastest way to enter the vast Middle East and North Africa (Mena) region’s plastics, petrochemicals and rubber industry, organisers say. The event, which showcases product from plant, machinery and equipment, plastic and plastic products industries, will be an opportunity to meet leaders of the plastics and rubber industry in addition to unveiling products, cutting-edge technology and revolutionary innovations and forging international alliances. SteelFab is the Middle East’s prime trade show for the metal working, metal manufacturing and steel fabrication industries. The event covers the sectors of surface preparation and finish, steel machining, welding and cutting, pipe construction and equipment and ancillaries. The expo brings together major players in general aviation, enabling them to discover the industry’s latest developments and innovations in a remarkable and convenient location, Al Bateen Executive Airport, the region’s only dedicated private jet airport, located in the heart of Abu Dhabi. Abu Dhabi Air Expo, which attracted 13,500 visitors this year, is designed for professionals and enthusiasts, and offers visitors a wide and representative range of the ever growing aviation industry. The new Abu Dhabi Midfield Terminal Project scheduled for opening in 2017 is a key reason behind the setting up of a dedicated area for airport suppliers at the expo. Al Bateen Executive Airport, Abu Dhabi, UAE. Saudi Print & Pack, the longest running industrial show in the country, caters to the networking needs of industrialists and key stakeholders in the printing, packaging, sign and graphics industries. It is an ideal platform to meet and discuss the latest industrial trends and business opportunities in Saudi Arabia and across the region, in addition to experiencing the latest and most innovative products and technologies. Riyadh Exhibition Company (REC) will be organising the 12th edition of Saudi Print & Pack for the first time in Jeddah, the major urban centre of western Saudi Arabia. Jeddah Centre for Forums & Events, Jeddah, Saudi Arabia. This leading international power event covers all sectors of the power industry including generation, transmission and distribution, nuclear, renewables and lighting. With its carefully focused profile and highly targeted audience, Middle East Electricity features more than 1,300 exhibitors and more than 40 technical seminars. It attracts senior level purchasers from around the world. The event comes at a time when the power industry of the Middle East and North Africa (Mena) is undergoing unprecedented growth, with investments worth $283 billion being pumped into the sector over the next four years. The largest international trade exhibition for the stationery, paper and office supplies industry in the Middle East features a broad international participation, with companies looking forward to expanding their business in the region. Open to only trade visitors, the event is an opportunity to find relevant suppliers from all over the world, develop relationships with key industry players, identify regional or domestic business opportunities, place direct orders and reduce supply chain costs. With more than $300 billion being invested into passenger and freight rail projects in the region over the next decade, Middle East Rail comes as a major opportunity to access the regional rail projects this year. 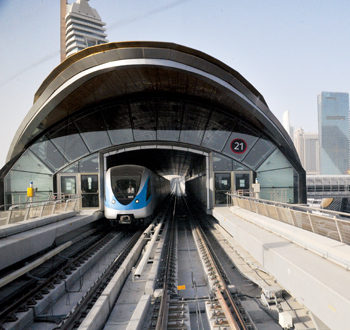 Middle East Rail 2015, the biggest rail conference and expo in the region, will give visitors a chance to join 7,000 transport, construction and logistics professionals across two days; meet rail operators and key buyers from across the region; source products and services from over 220 exhibitors in the 16,000 sq m expo hall. The event also features a conference and 150 free technical sessions. Arablab is a leading trade show for the analytical industry that reaches out to buyers from the growth markets such as the Middle East and Africa (Mea) and the Indian Sub-Continent as well as China and Asia. The technology show connects technology makers and end-users from across the world, and showcases the very latest laboratory and instrumentation equipment from all the leading manufacturers in the world. It covers fields such as clinical diagnostics; forensics and security; research and development; biotechnology and life sciences; energy and petrochemicals; drug discovery and development; measurement and testing; instrumentation and technology; laboratory technology.